Cardiff City have released defender Gary Croft as part of a summer clearout that sees 11 players depart. 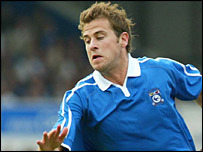 The 31-year-old has hardly figured in the Bluebirds' first team this season after a serious knee injury in August. Croft has failed to recover from reconstructive surgery following an accidental training-ground collision. However, Croft revealed he can still train with the club and has a slim chance of earning a short-term deal for next season if he can prove he is fit. "I knew they weren't going to offer me a full year, but I did get told by the management they were going to try and offer me a month-to-month deal," the former Blackburn, Grimsby, Ipswich and Wigan player told BBC Wales. "But when it came to it, the gaffer (Cardiff manager Lennie Lawrence) told me he was unable to persuade the people upstairs to give me that. "What was on offer was the... opportunity to train with Cardiff and perhaps secure an extended deal once I returned for pre-season. "But it's very vague and there's nothing in writing to say this is what is going to happen, so it's end-of-contract time really but with that opportunity. "It's a time for reflection now and moving on and perhaps looking at other things." Tony Vidmar is the other big name to go, with the Australia defender already set to join Dutch side NAC Breda. However, Neal Ardley and Willie Boland have both been offered new deals by Cardiff boss Lawrence. Ardley joined as a free agent from Watford in March on a short-term deal and the 32-year-old has proved a hit. Boland has been another stalwart, while there are also deals on the table for Toni Koskela, Darren Williams, Jonathan Kift and Anthony Taylor. The other players allowed to leave Ninian Park on free transfers are drawn mainly from the reserve and youth ranks. They are Kirk Huggins, Richard Ingram, Arran Lee-Barrett, Michael Parkins, Danny Thomas, Craig Attard, Sean Cronin, Michael Hartley and Jamie Rewbury.